We will be learning about the lives and achievements of the Ancient Egyptians during our first topic. Most of Egypt is a vast desert with almost no rainfall. The River Nile is one of the longest rivers in the world and it flows northwards from the mountains of Tanzania for over 6,000km on its way to the Mediterranean Sea. For more than 6,000 years the river has enabled people to live in Egypt. Today, 50 million people live within a few miles of the river and completely depend on its water. The river is home to many fish and provides a valuable source of food. The ancient Egyptians invented a number of different ways to bring water from the Nile up onto dry land. The shaduf and wooden water wheels were designed thousands of years ago to enable farmers to water their crops, and such methods are still used by farmers today. It was very important to ancient Egyptian religious beliefs that the human body was preserved. A method of artificial preservation, called mummification was developed by the ancient Egyptians. Mummification was a complicated and lengthy process which lasted up to 70 days. The Egyptian writing called hieroglyphics used pictures to represent different objects, actions, sound or ideas. There were more than 700 hieroglyphs. Some pictures stood for whole words. Interesting Fact: The Egyptians did not write vowels and did not use any punctuation. There were over 2,000 names of gods in Ancient Egypt. Some images of Ancient Egyptian gods and goddesses show them with a human body and the head of a bird or an animal. Animals were chosen to represent the powers of the god. Pharaohs were the king or Queen of Egypt. Most pharaohs were men but some well-known pharaohs, such as Nefertiti and Cleopatra, were women. A Pharaoh was the most important and powerful person in the kingdom. He was the head of the government and high priest of every temple.The people of Egypt considered the pharaoh to be a half-man, half-god. The pyramids are the stone tombs of Egypt's kings - the Pharaohs and one of the world's greatest historical mysteries. They have stood for thousands of years, filled with many hidden secrets: clues about what life (and death) was like in Ancient Egypt. 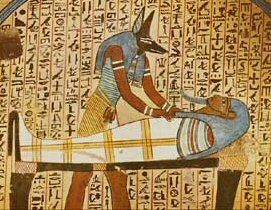 The Egyptians believed that if the pharaoh's body could be mummified after death the pharaoh would live forever. The tombs were designed to protect the buried Pharaoh's body and his belongings. Here are a few useful websites for you to use so that you can discover more about the Ancient Egyptians. Ancient Egypt - primary homework help Here, you can find out about a range of topics, including pharaohs, clothing, hieroglyphs and pyramids. Ancient Egypt - history for kids Amulets, canopic jars, games, farming and housing are just a few of the topics covered on this website.